Biographies allow us to follow the journeys of great men and women. Most people like to read biographies. They appeal to our innate desire to commemorate people who went before: we are part of them, and, by reading their biographies, we make them part of us. Biographies appeal to our sense of curiosity: they answer how others coped with the human condition. They appeal to our moralizing sense: they satisfy our need to see larger purpose and meaning in others’ lives and thus in our own. In his poem “A Psalm of Life,” Henry Wadsworth Longfellow wrote, “Lives of great men all remind us / We can make our lives sublime, / And, departing, leave behind us / Footprints on the sands of time.” Here, for your instruction and delight, are several recent biographies, ranging from the life of Jesus Christ to the experiences of a Mormon trader among the Navajo Indians. In the final part of their illuminating series on the Lord’s mortal ministry, The Life and Teachings of Jesus Christ, professor of Church history and doctrine Richard N. Holzapfel (BS ’80) and assistant professor of ancient scripture Thomas A. Wayment present volume 2, From the Transfiguration Through the Triumphal Entry (Deseret Book; 456 pp. ; $25.95). Twelve LDS scholars, in 18 essays, enrich our understanding of the Savior’s life and teachings by applying the latest research about the social and historical contexts of his times to his ministry and his relationships with family, disciples, and others. These same authors, along with Eric D. Huntsman (BA ’90), have also written Jesus Christ and the World of the New Testament: An Illustrated Reference for Latter-day Saints (Deseret Book; 327 pp. ; $39.95). This feast of a reference book chronicles the life and ministry of the Lord and is the most informative and readable guide on the New Testament that I’ve ever read. The authors offer “historical context and cultural, literary, and linguistic background for the New Testament” (p. 1) within the contexts of the Jewish, Greek, and Roman worlds at the time of Jesus and during the early and later ministries of the Apostles. 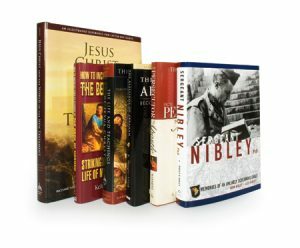 Setting the Lord’s life into these contexts enables readers to better understand the scope, depth, and richness of his ministry and teachings and the ministries of his Apostles. Copiously illustrated, this gorgeous book presents incisive, intriguing sidebars on some 300 topics. Wayment’s From Persecutor to Apostle: A Biography of Paul (Deseret Book; 236 pp. ; $19.95) is a biographical “appreciation” of Paul, “perhaps Christianity’s greatest missionary” (p. 1). While Wayment’s study of this Apostle’s life does not present new biographical information, this very readable book pulls it all together afresh and expands the reader’s understanding by setting Paul’s life and ministry in the era’s religious, cultural, linguistic, and historical contexts. E. Douglas Clark (BA ’77), in The Blessings of Abraham: Becoming a Zion People (Covenant; 331 pp. ; $29.95), has written a penetrating book about the remarkable Abraham and his equally yoked wife, Sarah. While Hugh Nibley’s Abraham in Egypt (2000), for which Clark wrote the foreword, continues as the premier scholarly defense of the Book of Abraham, Clark’s study of the meaning of the patriarch’s life is an illuminating, expansive biography—a 12-chapter examination of Abraham’s mission to establish Zion on Earth in ancient and latter days. Clark skillfully synthesizes ancient, modern, and apocryphal scripture, the writings of ancient and modern scholars, rabbinic texts, the Qu’ran, and numerous other sources about Father Abraham and Mother Sarah. His work shows how the lives of this righteous pair exemplify and prefigure the mission of Jesus Christ, the salvation of mankind, the sealing powers of the holy priesthood, and the establishment of Zion. This is a powerful book. Keith B. Schofield (B ’52), in How to Increase Your Enjoyment of the Book of Mormon (Granite; 270 pp. ; $17.95), has written an inspiring and motivating biography of the prophet Mormon. Squarely based in the Book of Mormon and on reasonable inference, Schofield undertakes “to reveal Mormon’s life, his spiritual brilliance, and to chronicle his creation of the Book of Mormon, . . . [and] inspire and impel the reader to become a more profound student of the book” (p. 225). Subtitled Striking New Insights into the Life of Mormon and His Work, this biography brings Mormon to life as a man of exceptional qualities as a forceful military leader yet endowed with great humility and spiritual sensitivity as one called to collect, edit, and add to “the greatest religious epic ever produced by one man” (p. 169). Carol Cornwall Madsen, in An Advocate for Women: The Public Life of Emmeline B. Wells, 1870–1920 (Deseret Book/BYU Press; 498 pp. ; $21.95), has crafted an intriguing biography of one of Mormonism’s leading women. A devoted Latter-day Saint and mother of five children, Wells was a leading feminist in the cause of securing rights for women (Utah women gained the right to vote a half-century before women in the rest of the United States). She was also editor (for 37 years) of the Women’s Exponent, the LDS women’s newsletter; a tireless writer of poetry, fiction, and articles; and president (called at age 82) of the Relief Society. This well-written and well-researched biography (enhanced by excellent photographs) beams a deserved spotlight on one of Mormonism’s most remarkable women. The late Hugh Nibley and his son Alex Nibley collaborated, in Sergeant Nibley, Ph.D.: Memories of an Unlikely Screaming Eagle (Shadow Mountain; 366 pp. ; $24.95), on a delightful and surprising follow-up to Boyd Jay Petersen’s fine biography, Hugh Nibley, A Consecrated Life (2002). Already a PhD and college professor when he enlisted, 32-year-old Hugh was trained in military intelligence and was eventually assigned to the 101st Airborne Division—“The Screaming Eagles”—where he took part in the D-Day invasion and was later reinserted with the 101st during 72 days of fighting in Holland. This book is a gripping view of life under fire as seen over the shoulder of a brilliant young man during the terrible battle for Europe. Along Navajo Trails: Recollections of a Trader, 1898–1948, edited by Susan E. Woods (BS ’78) and Robert S. McPherson (MA ’76) (Utah State UP; 270 pp. ; $21.95), is the memoir of Will Evans, who for 50 years was a trader to the Navajos and the proprietor of the Shiprock (New Mexico) Trading Company. Evans’ affection for, friendships with, and unique access to Navajo culture spilled into this rich record of what Evans learned and experienced among “Navajos I Have Known” (one chapter title). An artist, keen observer, colorful writer, and devout Latter-day Saint (he was the first mission president of the Southwest Indian Mission), Evans understood the spiritual and artistic value of Navajo crafts and culture; he was moved by Navajo medicine men and by the tragic history of the Long Walk and the Beautiful Mountain Uprising. Evans compiled many of his pieces about the daily lives and lore of Navajo men and women into a book manuscript, which remained unpublished at his death in 1954. Susan Evans Wood, his granddaughter, teamed with historian Robert McPherson, author of numerous studies of Navajo and Four Corners history, to publish this illuminating book, richly illustrated with hitherto unpublished photos. Richard H. Cracroft is the Nan Osmond Grass Professor in English emeritus. Karin Mei Li Inouye’s (BA ’05) novel-for-film Walk Without Notice (Palmyra Press; 182 pp. ; $14.95) is a gripping fictionalized history of Ying and her family as they are torn apart by the revolutions of modern China and she is taken to America as a bartered bride. Inouye captures, in Chinese accents and manner reminiscent of Maxine Hong Kingston’s The Warrior Woman (1976), how different and yet familiar the world looks through Chinese eyes refracted by American lenses. Nathan K. Chai’s (BA ’02) Fire Creek (Palmyra Press; 148 pp. 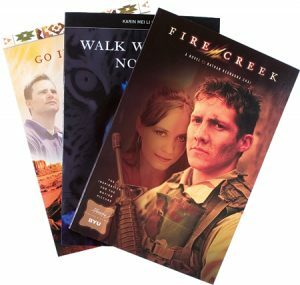 ; $14.95) follows the physical and spiritual rehabilitation of marine Jason Chang as it takes place in Esperanza, Utah. Wounded in combat in Afghanistan, Jason finds his way through spiritual and emotional numbness to wholeness as he discovers the Lord’s tried-and-true dynamic of losing yourself to find yourself. Here are Latter-day Saint values written boldly yet subtly and readably. In Go in Beauty (Palmyra Press; 227 pp. ; $14.95), by veteran fiction writer Michael B. Fillerup (BA ’76), the LDS vision of the linear, material world—as held by the Navajo reservation’s new teacher and branch president, Max Hansen—and the organic, non-linear world of the Navajo are brought into striking confrontation. Packed with anthropological glimpses into the Navajo world and insights into the human condition, this novel tells the deeply moving story of Max’s lifelong journey through personal guilt and staggering loss toward hozho—the Navajo word for walking in holiness, beauty, and harmony.